* Check the back of your permit for a Road Test Date. If you do not have one, you have to go to DMV and get one, or contact our office six months prior to your 17th birthday and we can take care of it. Appointments CANNOT be made over the phone. * IMPORTANT: Getting a road test appointment at DMV, or having us set up a road test appointment at DMV for you, is Not Confirmation that we will be taking you for your road teat. You must call our office to make these arrangements. * We do have cars available for the road test, but to guarantee availability you should call at least 3 weeks before your road test date, to schedule an appointment, for us to bring you for your road test. A review lesson the same day prior to the test is highly recommended, and our license service will have the instructor stay with you to purchase your driver's license, when you pass your test. Ask about these when you call our office. Do not make arrangements with the instructor. You must call our office to set up any appointments. 1. Your complete validated NJ permit. 2. Valid ID: original Birth Certificate, passport, green card, etc. (photocopies are not acceptable). 3. Glasses or contacts if required for driving. 4. 6 Points of Identification. 5. $6.00 for a provisional license and the check should be made payable to "NJ MVC"
6. A properly registered and insured vehicle to be used for the Road Test. 7. A licensed driver to accompany you to the test. 8. Cash or a check made out to Safety First Driving School for the appropriate amount if we will be bringing you to the road test. 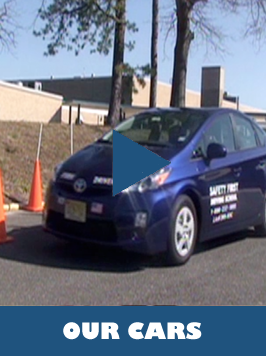 * You may drive yourself to the testing area, as long as you are accompanied by a 21 year old or older NJ licensed driver. If your licensed driver is licensed from another state other than NJ they must drive the vehicle to the Road Test. Remember practice driving on the actual test course is prohibited. * Remember NEVER move the vehicle unless a licensed driver is in the vehicle. When using your own vehicle for the road test, please be aware of the following: You cannot use a vehicle that has any type of console that would prevent the examiner from reaching the brake. This type of vehicle must have a hand brake in the center console. If it does not it cannot be used for the road test. * If you pass the road test, your permit is no longer valid. You must get your provisional license before you do any further driving. If you fail your test, you must wait at least 2 weeks before you can retake the test. You will be required to repeat all phases of the road test, not just the ones you failed. If you fail your test 4 times, you will be required to wait one year before you may take the road test again.